While at work (2010) I received a telephone call from the local vet stating there was a small white ferret in need of a home and was I interested. When I arrived to collect the ferret a young, friendly, gentle and large Jill ferret greeted me. Evidently two young boys had found her walking down a road some miles distance from the surgery. I introduced her to the rest of the girl gang without problem, as is normal a pecking order was established, although in time Jenny became joint top along with all the other members of the gang. 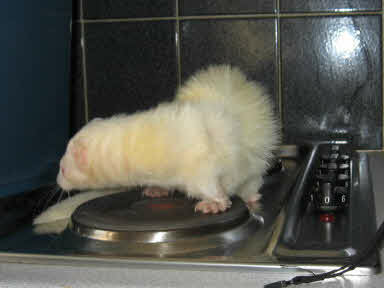 She is a beautiful albino ferret with an independent mind .